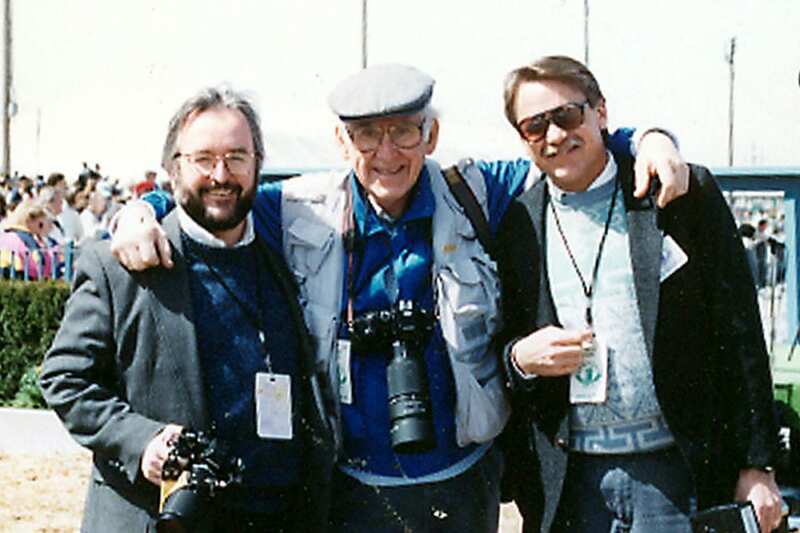 Photographers John Engelhardt, Tony Leonard and Patrick Lang at the Jim Beam Stakes. Surrounded by his family and longtime friend John Engelhardt, Patrick Lang died peacefully late Friday afternoon at the age of 65. After more than 30 years of making photos from the finish line, track photographer Pat Lang had hung up his camera three years ago. For over three decades, Lang had devoted his career to capturing the winning moments of the horses, trainers, owners and jockeys at River Downs, (New) Latonia which became Turfway Park and Keeneland race courses in Ohio and Kentucky. Over the course of his career, Lang captured historic, memorable moments of some of racing's most talented horses; Silver Charm's and Wild Rush's Kentucky Cup Classic dead heat at Turfway Park; Spend A Buck's 15-length Cradle Stakes win at River Downs preceding his Kentucky Derby triumph; Wise Dan's maiden win at Turfway Park and graded wins at Keeneland before going on to back-to-back Breeders' Cup Mile wins; Animal Kingdom's maiden victory at Turfway Park and his romp in the Spiral Stakes before galloping into history with his Kentucky Derby and Dubai World Cup wins. Perfect Drift, Winning Colors, Brass Hat, Catlaunch, Harlan's Holiday, Street Sense… the list of notable horses that have run into Pat Lang's frame and across the finish line over the years goes on and on. Lang also photographed the beginnings, milestones and comebacks of many careers of racing's most respected horsemen; jockey Rafael Bejarano's humble beginnings at River Downs; jockey Julien Leparoux's rise to fame at Turfway Park; the beginnings of trainer Ken McPeek's career at River Downs; the start of trainer Dale Romans' career at Turfway Park. He was on the finish line for the first wins of Alysheba and Rachael Alexandra. Lang also documented jockey and local legend Perry Ouzts' 5,000th, then 6,000th, career wins — placing him in a category that only 16 other men on Earth had ever achieved at the time. Apart from the famous horses and nationally recognized trainers and owners, Lang's warmest memories were the many conversations he had with regular clients and fellow photographers over the years. Often stopping to talk while dropping by the office to pick up their pictures; to grab a handful of peanuts, a cookie, a sucker; or to duck in for some relief from the searing summer heat at River Downs, the brutal winter cold at Turfway Park or the pouring spring and fall rain at Keeneland between races. Lang's resume prior to his life in horse racing comes as a surprise, even to those who knew him well. Lang, a New Mexico native, was born in Roswell and grew up in Hagerman. After attending New Mexico State University, he became a radio disc jockey in Las Cruces and was the co-owner of Flip Side Records, a chain of three record stores. Those who listened to his late-night progressive rock show would have known him, not as Pat Lang, but as Billy Pilgrim, a pseudonym lifted from a Kurt Vonnegut protagonist who traveled freely back and forth through time and space. Lang did use his real name, however, for his second career as a radio journalist and news director for KOBE-AM in Las Cruces, as a TV correspondent for KOAT-TV in Albuquerque and as a reporter and cinematographer KTSM-TV and radio in El Paso, Texas. As someone whose career as a photojournalist involved documenting and reporting on people's individual losses, from fires to accidents, Lang loved his transition to photographing horse racing at River Downs and Turfway Park (at the time Latonia) in 1982. This entry was posted in NL List, People and tagged Alysheba, Animal Kingdom, Brass Hat, catlaunch, chip bach, Harlan's Holiday, John Engelhardt, Keeneland, pat lang, patrick lang, Perfect Drift, Perry Ouzts, photographer, Rachel Alexandra, racing photographer, River Downs, Silver Charm, spend a buck, Street Sense, turfway park, winning colors, Wise Dan by Press Release. Bookmark the permalink.